I can't believe in 2 days' more, it'll be 2014! 1. 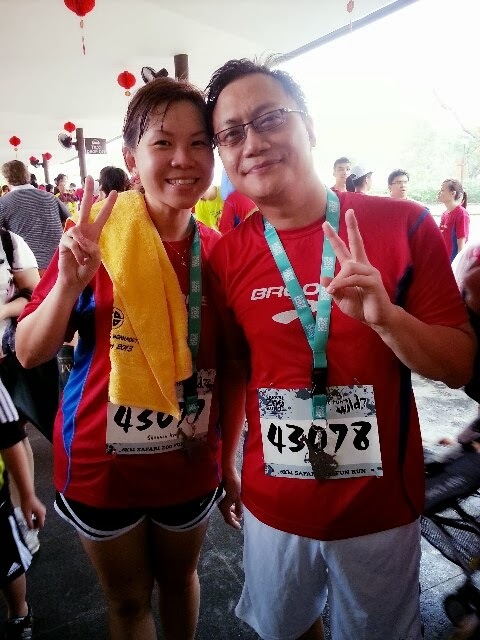 Jan 2013 - Green Corridor Run - my virgin run which was a 10.5km trail run stretching from the old railway station at Tanjong Pagar to Bukit Timah. Most thought I was crazy to attempt a trail run for my first race ever but it wasn't really that bad and it wasn't really as trail-y as what you would experience at MacRitchie. I survived and finished it in 1:30 which was fairly good for me, considering the fact that there were a few bottlenecks because the ground was terribly muddy from the heavy rain the day before. The best part of this race was that I re-connected with two of my very dear friends. One was Sharon, whom I didn't meet after JC years (hell, I don't even remember we went to the same JC because I was from Science and her, Commerce). The second one was Esther, whom I haven't met since 2004 or so, I think. 4. 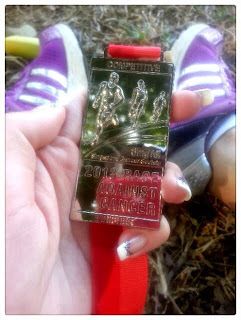 July 2013 - Race Against Cancer 15km run. I registered to be a charity athlete with the Singapore Cancer Society shortly before that set up a donation portal on GiveAsia to garner donations from the running events i took part in. Can I say, this was my WORST race ever? I didn't train hard enough because I had a super stubborn, recurrent upper tract infection that refused to leave me for the next couple of months. Didn't help that the race started at 7-ish and at about 9-10km, the sun was up and ready to fry me alive. 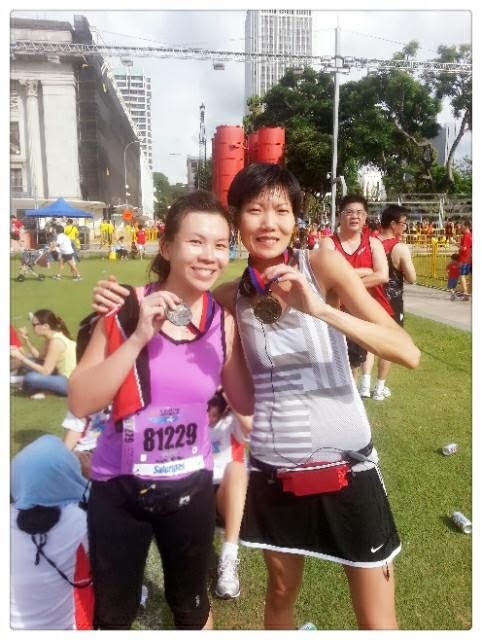 I must say this was one of my most gruelling runs ever afterwhich I collapsed (well, voluntarily lah) after I ran past the finishing line and collected my medal (yes, going to die still must collect race bling first can!). 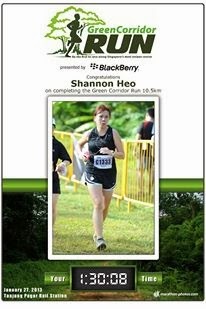 I suffered from extreme nausea immediately post-race and felt like I was going to black out. I couldn't get a taxi home 2-3 hours after the entire event ended and was stranded at ECP until my knight in shining armour sneaked off work to rescue me. The fact that i didn't eat or hydrate myself properly pre-race probably also played a part in all that drama. This race definitely takes the cake as the WORST race of the year, but I also learnt many lessons from it and realised the importance of a good training plan, hydration and fuelling up before a race. 5. Sept 2013 - Army Half Marathon. 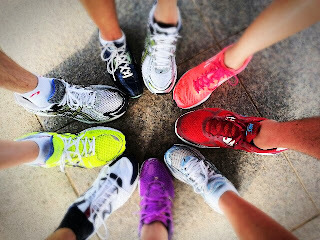 To commemorate my 1 year anniversary ever since I picked up running, I signed up for the AHM (with my running 损友, Sharon) in a moment of recklessness I believe! Again, there were some people who thought I was crazy (Why are people such wet blankets and why do people bother saying I'm crazy, knowing I REALLY AM! :P) because I am not a seasoned runner and they deemed it premature for me to attempt a half marathon within such a short time after I started running. You know what? There is really NO "good time" to do anything. The only "good time" is NOW. I learnt that in July 2010 when I lost many of the normal functions most people take for granted. Now, I seize the day and am thankful for every living, functional day. Anyway to side-track, I wanted to join the Mt. Faber Run earlier in June 2013 too, but was persuaded out of it because some people thought it was too tough for me. It's not that i'm overly confident but i love a good challenge and really, what is the worst that can happen to me? Crawling to the finishing line? I can deal with that. :) I regret being swayed by those words that planted self-doubt in me and have made up my mind to conquer Mt. Faber in 2014! Anyway, I really, really enjoyed the AHM because it was my first half marathon and I completed it without having to ride the ambulance back to the finishing line - I trained pretty hard initially until a couple of weeks before the event when i suffered another mild relapse. In fact, I was having some problems running properly, especially during that stretch at Gardens By the Bay, but hey i made it in the end, unscathed! It would have been perfect if there weren't so many smelly, army boys but hey, Life isn't perfect, is it? :) My unofficial timing was 2:54 but official timing (because of the irritating bottleneck that kept me standing among SABs was a good whole 30 mins) was 3:30. BOO! Another relapse in between September and November, this time more severe than the previous one, knocking me off balance (literally and figuratively) so much so that I couldn't train at all. 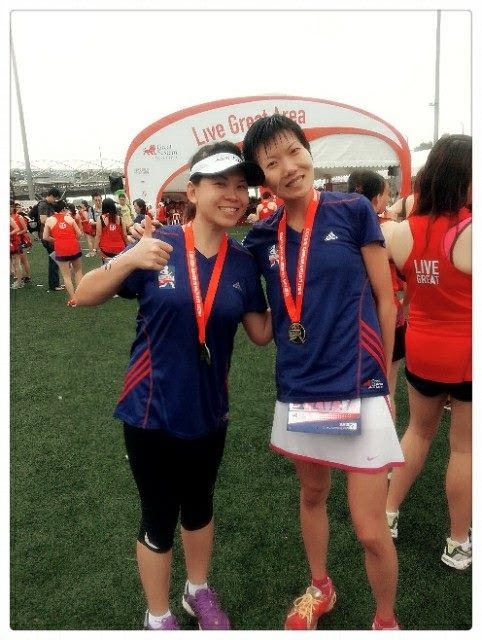 From the AHM to the GE Women's Run, I only ran a couple of times and did not do any LSDs. :( My neurologist was hesitant about letting me participate in the GE Women's Run but he left the ultimate decision to me and of needless to say, I went ahead. You know, my life is pretty much NEVER about who is going to let me, but who or what is going to stop me. And usually, no one (not even my Papa or Mama) dares to stop me. Heh!